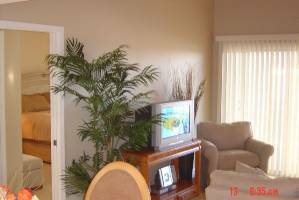 Come enjoy Floridas Treasure Coast and stay in this tastefully newly redecorated partial ocean view, second floor condo (no wheelchair access - sorry!) Located in Ocean Village on South Hutchinson Island, this property is known to be on of the premier properties on the island. 1400 square feet of living space plus a lanai. 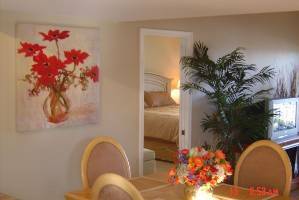 All bedrooms plus lanai have a partial ocean view. 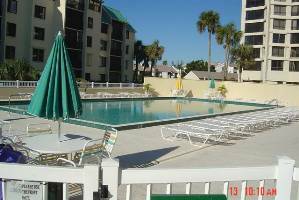 Just steps from the beautiful, uncrowded Atlantic Ocean beaches and the heated pool and grilling area. 3 Bedrooms - Master has king pillow top bed and walk in closet - second bedroom has queen pillow top bed - third bedroom has 2 twin beds. Each bedroom has its own TV. Plenty of linens and towels provided. 2 1/2 baths with full tubs and showers plus a washer and dryer for your use. 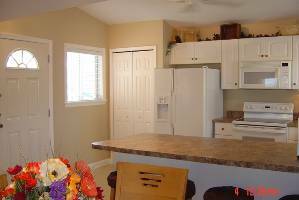 Complete, fully stocked kitchen, with side by side refrigerator with ice maker, glass top stove, dishwasher, microwave, wine cellar and coffee maker. Relaxing indoors? 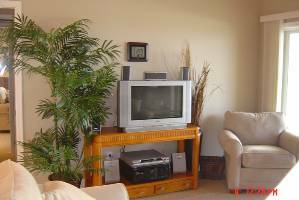 Enjoy the 32 inch flat screen TV with DVD player or the stero system with surround sound, I-pod input jack and CD changer. 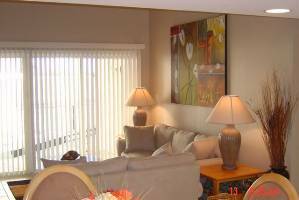 Wireless internet access is also available for your use in the condo. Going to the beach or pool? There are beach chairs, flotation devices, coolers, boom box (for beach use only! ), and beach towels provided for your use. You can check out the Ocean Village property at www....com to get a full listing of all the fun things going on! 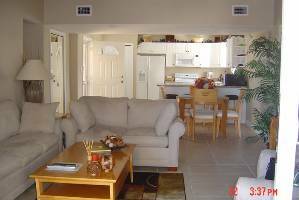 LOOK NO FURTHER AND GO WITH THIS CONDO!! My family and I were looking for a nice place to stay while we were in town vacationing and visiting with family. I looked for weeks on end and e-mailed several people asking about the condos they had on-line for rent. The Biedrzycki's e-mailed us back in a timely manner and answered any questions without hesitation (very nice to deal with). The condo it's self was BEAUTIFUL!! 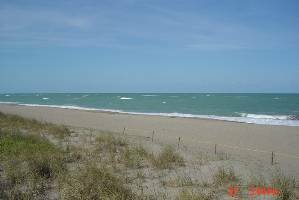 My mother was with us and had plans of staying with my aunt; who lives in Fort Pierce, for most of the visit. When we got there and she seen the condo she changed her mind very quickly and stayed with us at the condo for all except one night! You can not go wrong with this condo. It is at the end of the condo unit, so you walk around the end and the steps across the dune are straight back. The closest swimming pool is just across the parking lot. My kids (age 15 boy, 13 girl, and 8 girl) loved feeding the turtles and fish in the pond beside the pool (I'm sure the fish and turtles gained a few pounds during our visit)! If you have kids who love to touch things, be sure to take them by the Oceanographic Society. I just cannot say enough about how nice the Biedrzycki's are and how beautiful the condo is. All thumbs up and straight A’s from all of my family!! Thank You Dennis and Nancy for sharing your beautiful condo! Deposit: 1/2 rental amount due to secure your reservation with a signed lease. Balance of lease amount plus tax, plus a refundable $300 security deposit is due 30 days prior to lease commencement. Cancellations and Refunds: For cancellations: The rental fee is not refundable if cancellation occurs less than 60 day prior to the rental date. However, the security deposit is refundable.